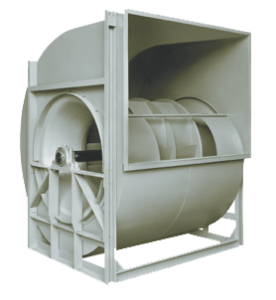 These heavy-duty backward inclined centrifugal blowers are available in most arrangements in either single width, single inlet (SWSI) or double width, double inlet (DWDI) – Class I,II, and III. The Peerless Blowers PowerFixed non-overloading blower is built for the many applications required by both commercial and industrial users. The backwardly inclined flat blade construction produces a high efficiency blower ideal for medium and high pressure applications. This highly efficient design provides for extremely quiet operation. Each blower housing is continuously welded for sturdy construction. Only rugged duty cast iron housed bearings are installed in the PowerFixed blower. Shafts of non-sulfurized carbon steel are precisely turned, ground and polished for a precision fit. Each wheel is statically and dynamically balanced for optimum trouble-free performance and longevity. The PowerFixed non-overloading blower is built with dependability and minimum maintenance in mind. Wheel sizes run from 10-1/2 thru 49″ SWSI and 12-1/4 thru 24-1/2″ DWDI, and are available in all AMCA construction classes. Our many accessories and arrangements allow for various individualized applications.